Eastern Mennonite University celebrated its centennial year convocation Wednesday at Lehman Auditorium. President Susan Schultz Huxman offered the keynote address, with three presidents emerita seated with faculty and staff on the stage. 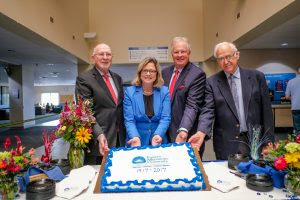 Presidents emerita (from left) Joe Lapp, Loren Swartzendruber and Myron Augsburger celebrate with President Susan Schultz Huxman following Eastern Mennonite University’s centennial year convocation. Representing more than 50 years of leadership were Myron Augsburger and wife Esther, Joe Lapp and wife Hannah, Loren Swartzendruber and wife Pat, and former interim president and provost Beryl Brubaker and husband Mark. Centennial history may have been foremost in many minds, but student body co-presidents Caleb Schrock-Hurst and Luke Harnish gave a special nod to their fellow students. As she’s been in office since January and was inaugurated in April, this was Huxman’s first opportunity to welcome a new class of first-year students to EMU — the first group of students who will spend all four of their years on campus in EMU’s second century. She offered two parallel narratives, the first based on the popular children’s book The Carrot Seed by Ruth Krauss, about a little boy with great faith that his carrot seed would sprout. A second narrative highlighted the “radical roots” of EMU’s founders, who believed in the institution and persevered, despite great odds, in its founding and eventual flourishing. From seven students, five faculty, and three subjects of study in 1917, the university has expanded to nearly 1,800 students in undergraduate and graduate programs,148 faculty, 40 majors, and two additional instructional sites in Lancaster and Washington D.C.
After the final hymn, students traveling on cross-cultural during the semester were invited to the front for a prayer and blessing, as happens during each fall and spring convocation. This time, it was the Middle East cross-cultural group, led by Bill Goldberg and Lisa Schirch, which leaves tomorrow — the 25th semester program to the region since 1982.